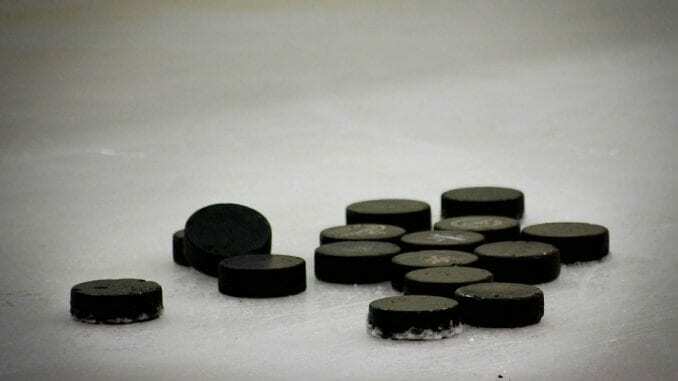 It was honours even after the Smith Recycling Milton Keynes Lightning’s return pre-season challenge match with Guildford Flames at the Spectrum Centre on Sunday. Following Saturday’s 5-2 win at Planet Ice Lightning went down 7-4 the following day as the Surrey outfit were aided by a large number of penalty calls on MK players with the visitors not having a powerplay until the 36th minute. By that stage the officials had already dished out 34 mins of penalties on the visitors who were being watched by new head coach Doug McKay who had flown into the country only hours earlier. It was almost the reverse of Saturday’s encounter when Flames, who you can check on betting.org for latest odds on their Elite League title hopes, picked up the bulk of the penalty calls. At Guildford there were two early calls on Lightning with Eric Neiley and Cole Shudra visiting the sin bin for slashing and interference without consequence to the scoreline. In fact it was MK who edged in front on 10mins 2secs with a short-handed goal from Trevor Morbeck, supplied by Neiley. It took Flames just 20 seconds to reply through a Kevin Phillips assisted strike from Erik Lindhagen before Lightning were back in front thanks to Joonas Huovinen at 15mins 48secs. Once more though the lead was short lived, with Jordan Abt and Ian Watters combining to provide for Kruise Reddick on 16mins 39secs. The second period was just 12 seconds old when Rio Grinell-Park became the first of the session’s MK players to be penalised – the offence being hooking. Over the following 14 minutes Lightning found themselves defending five on three short-handed spells on three occasions. The pressure told on the second of those while Andreas Valdix and Radek Meidl were both serving time for hooking, Flames taking advantage as Reddick bagged his second of the game, assisted by last season’s club top points scorer, John Dunbar and Calle Ackered on 27mins 50secs. Just over two minutes later at 29mins 54secs Abt was the provider for Evan Ritt to make it 4-2 to the home side and the game edged further away from Lightning when Jesse Craige set up Watters on 34mins 22secs. Lightning’s first powerplay came as Ackered was called for holding the opponent’s stick on 36mins 58secs – the man advantage was brief though with Tim Wallace sent to the cooler for slashing only 31 seconds later. It was while the teams were four on four that Flames were to effectively put the result beyond doubt with an Abt strike 1min 46secs from the second intermission. Adam Goss replaced Patrick Killen in the Lightning goal for the final period but it was the Brit who was picking the puck out of the net when Ritt supplied Lindhagen for a short-handed goal on 47mins 15secs. One minute three seconds later Neiley – assisted by Wallace and Meidl – cut the deficit with Owen Griffiths grabbing a fourth goal for Lightning after 54mins 14secs. Late penalties on former MK captain Kevin King and Craige for interference and hooking respectively gave the travellers a five on three powerplay for just over a minute but they were unable to close the gap any further as Flames finished 7-4 victors. Man of the match: Trevor Morbeck.